During my recent family summer vacation, I ran across two very different consumer packaged goods (CPG) summer promotions, one a very effective marketing strategy and execution and one I’m quite sure will not drive significant results. As a tech marketer, I have deep respect for my CPG colleagues because they have access to huge amounts of data, vast customer knowledge and significant budgets we tech marketers can only fantasize about. And they are very analytical in their approach, something I work to emulate here at ThinkResults. The first promotion I saw was one on Heinz Ketchup bottles. We had just ordered our meal at the airport restaurant and had a little time on our hands. Like any mom (big target for Heinz ketchup), with a cranky, hungry, travel-weary crew, I immediately wondered how I could occupy them so we didn’t have a meltdown before the food arrived (myself included). And voilà! There was the Heinz bottle beckoning me with a bright label “Up for a Game?” and a Trivial Pursuit offer. My family of readers is always game for Trivial Pursuit so, I flipped the bottle over, scanned the barcode (nice useful use of a barcode here BTW …) and we were off happily playing a mobile game of Trivial Pursuit. We played about four rounds and everyone had fun with it. The game ultimately led me to a Heinz ketchup coupon, which in exchange for an email, I could have received. All in all, it took about 15 minutes and fully entertained my family during a natural lull in travel activity. Excellent product placement, smart thinking about the needs of your customers (moms and dads with hungry kids), great use of a barcode, fun activity, all in all, an excellent promotion that I’m sure will drive sales of Heinz ketchup. Nicely done, Heinz marketers! Then, it was time for my after dinner snack. I’m a huge lover of the 100 Grand chocolate bars so it was time for a travel treat. This was one of those 17-hour travel days with a long flight ahead of us. I bought it, ate it and then when I was done, noticed this code on the inside of the wrapper. 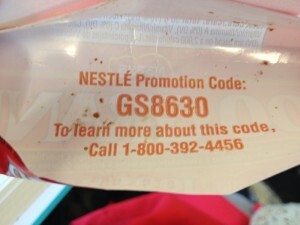 At right: Nestlé 100 Grand chocolate bar call-in promotion code, found on wrappers. Source: My own phone, after I ate the chocolate bar (so please excuse the chocolate bits on the wrapper). So what is wrong with this picture? First of all, there was NO mention of the promotion on the outside of the wrapper. Huh? Isn’t the purpose of a promotion to get people to buy more product?? Secondly, it tells me to call, like on the phone, to learn more. Um, maybe Nestlé has missed the memo that no one uses a phone to actually call anyone anymore. Assuming their target market is under the age of 55, and most likely, mostly under the age of 25, that segment seems to have phone-calling phobia and wouldn’t call the number even for a bag full of 100 Grands. Texting and interacting online is the primary mode of communication for their assumed target market. Even I, in my significantly more than 25 years of age, would never call a number for a promotion. Even if we assume I was in the segment of the population that might be inclined to call, why would I? The wrapper gives me no indication of what I might win, or even what might happen if I were to call that number. Very poor planning, weak knowledge of the target market habits (unless 100 Grand is for “old people”), and I suspect very poor results will ensue from this promotion. The whole experience just reinforced for me the importance of really knowing your target, what their daily life is like, and how you can ease some of their daily pains, even if it’s not directly related to your product. Helping customers make their life easier goes a very long way toward building brand equity. I thought the Heinz campaign was brilliant. How could you incorporate some of that thinking into your promotional plans?